Amish crafted structures vary from storage sheds to cabins to garages. Barns in their many varieties (mini-barns, horse barns, portable barns and others) are an important part of the Amish outdoor building industry and have proven popular with consumers across Ohio and North America. 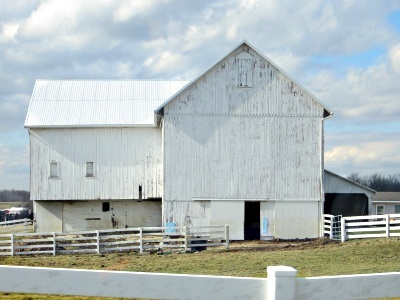 Within Ohio, many Amish barn outlets can be found, within convenient distance of major Buckeye State cities including Columbus, Cleveland, Cincinnati, Toledo, Dayton and others. Scroll down or use the jump links to find the nearest Amish barns dealer to you. The Home Place is a family operated business owned by Delbert and Susan Schlabach. They provide quality built indoor and outdoor items made by skilled Amish and Mennonite craftsmen. Some styles of mini-barns available. The Home Place is located one hour northwest of Cincinnati. The Wooden Branch features Amish-built outdoor structures including mini-barns, large barns and metal barns. Clear Creek Amish Furniture is a Cinncinati-area Amish barn dealer. They cooperate with over 60 Amish woodworking shops located in Indiana, Ohio and Pennsylvania. Broad choice of hand-built outdoor items including barns in a variety of models such as Gambler, Quaker barns, storage barns and mini-barns available. Miami Valley Barns carries a range of Amish-built products including barns, garages, sheds and gazebos. Budget series barns are quality built and provide an affordable storage place. Each structure can be customized to any needs. Miami Valley is a source for outdoor Amish structures. Clabo Amish Barns carries some Amish-made structures such as barns, gazebos and sheds. They offer wood and vinyl buildings in a range of colors and sizes to choose from. Models of barns include hi-wall, hi-loft, tack barns and porch barns. Barns, garages and sheds built by Amish craftsmen. In business for over 30 years. West Cleveland location, Avon/Westlake area. Amish-constructed buildings and outdoor furniture in the Geauga County Amish community area. Forty minutes east of Cleveland. Selection of Amish-made products including structures such as the Scioto barn-style storage building. Southwest Cleveland area. J & M Amish Contractors offers the skills of an Amish crew that can built a post frame barn in any size. They build in central Ohio locations including Kingston, Laurelville, Tarlton, Amanda, Circleville and surrounding areas. Delaware Sheds and Barns is a north Columbus area Amish structures provider. They carry Amish-built barns among a choice of sheds, cabins and garages. Amish Country Barns provides a broad choice of buildings hand-crafted by Amish contractors from Holmes County. Pole barn style garages, mini-barns and stall barns come in a varying choice of styles such as Gambrel, Saltbox, Single point along with a variety of options including roof line, roof pitch, shingle colors and finish options. JDM Structures specializes in storage barns, garages and cabins that come in a variety of colors, building options and styles. JDM is located in the heart of Holmes County, Ohio. Kauffman Lawn Furniture is a Holmes County Amish-built outdoor structure supplier. They carry different products including storage barns in a broad selection of styles such as Gardener, Hampton, Brook Side, Ontario, Lexington, Scioto, Windsor and more. Miller’s Storage Barns features quality storage buildings including barns and sheds. Miller’s is located just outside the small town of Berlin, in the heart of Amish Country Ohio. Twin Oaks Barns has been in business since 1973. They provide quality-built outdoor structures including storage barns, pergolas, gazebos and more. Hickory Circle specializes in timber frame construction. They built timber frame homes, barn homes, horse barns and pavilions. Wengerd Mini Barns is a Holmes County supplier for Amish built storage barns, garages, playhouses, chicken coops, equine barns. They provide free delivery to a limited area. Weaver Barns carries a broad choice of outdoor structures including sheds, garages and Dutch style barns. Weaver Barns is a Holmes County Amish outdoor items dealer located in Sugarcreek on the eastern side of the Amish settlement. Pine Acres Woodcraft offers mini barns, gazebos, pavilions and cupolas for sale. Jack’s Amish Country Konnection is an Amish indoor and outdoor structure manufacturer in the Toledo area. They offer a big selection of storage barns in a variety of styles such as Gable, Victorian and Cottage. A wide range of options including door (prehung metal door, arch top, overhead doors), roof (tar paper, ridge vent, soft vent, large or small cupolas), and siding colors to choose from. Herron’s Amish Furniture is located a one hour drive southwest of Toledo. They provide Amish custom-built storage barns. Salem Structures is a Youngstown-area Amish outdoor buildings dealer. They carry a broad choice of Amish built horse barn models such as Trailside, Kennebec, High Country barns, Monitor barns and more. Each structure can be customized to any needs. Please verify hours of operation of Ohio Amish barn dealers given here. Business locations and operating hours can change. As a rule, Amish-owned businesses will be closed on Sunday according to Amish beliefs prohibiting work on the Sabbath. Non-Amish barn dealers may be open on that day, however. Not responsible for changes to the above information. I need a quote on a 12×28 shedrow with 2 stalls and a tack room with a 8ft overhang the full length of the front as soon as possible built and delivered and set up…. will end up sprayying too scrub out every one of the kennel openings. How will it physically customize the landscspe on orr around your property.